Anyone around when I announced the winner of my Monkey Stocks League Challenge? Anyway, as promised in my 2-year update, I bring you the ‘what happened next after 3 years’ update. 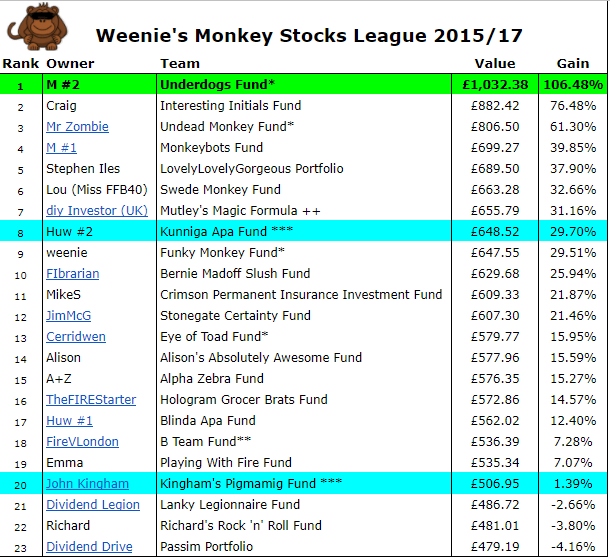 Here’s how I came up with the idea of running my own Monkey Stocks League Challenge. The majority of the £500 portfolios (consisting of 5 stocks each) which lined up in September 2015 were made up of stocks/shares (from FTSE 350) and were randomly picked out of a hat. A handful of daft brave souls followed me in purchasing their random stocks for real! The league also had a couple of portfolios chosen by experts (John K and Huw) and of course, we had M’s infamous portfolio, based on the Dogs of the FTSE strategy, which was the runaway winner of the league after both 1 and 2 years. 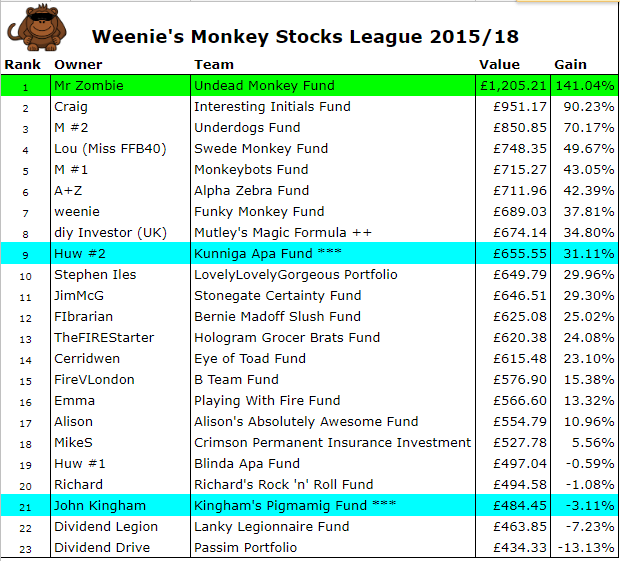 Zombie annihilation, with Mr Z’s Undead Monkey Fund taking the top spot, more than doubling his initial investment. What’s in the winning portfolio? Anyway, after one year, only 8 portfolios made gains of >10% and there were 10 portfolios showing losses. After two years, 17 portfolios made gains of >10% (12 of them >20%) and there were only 3 portfolios showing very small losses. After three years, again, 17 portfolios made gains of >10% (14 of them >20%), with 5 portfolios showing losses. John K’s Pigmamig Fund was one of those which ended up in the negative after 3 years, but had this been a real portfolio, I’m sure John would have gotten rid of some/all of those stocks to minimise/avoid losses using his own investing strategy. Mention must be made of diy’s Mutley’s Magic Formula fund which continued to maintain its steady process and remained in the top 10. This fund was based on Vanguard’s 60% LifeStrategy Fund, ending up with a gain of 34%. Definitely one for the passive investors and one which I will invest in myself. Of course, as before, in no way am I recommending that randomly selecting stocks is a viable investing strategy, though I find it’s a fascinating one, which appeals to my gambling curious nature! Did my experiment show that randomly picking shares ‘might not’ result in disaster? Of course, we have seen the FTSE breaking records these past three years. What would have happened if there was a big Bear market? A 3-year measurement still isn’t great for a buy and hold strategy but this will be my last update for this league. Whilst the first year was fun (especially as there was a trophy at stake! ), it was a complete chore getting all the dividends for the 100+ companies, plus I had to find out what happened to companies which were bought out/sold, changed names or were no longer trading. I’m still very much interested in the random walk theory in relation to investing so I won’t rule out creating another small experimental portfolio in the future (and again with real money). Sorry, I won’t be running another such league though – far too much effort and not nearly enough people with skin in the game! Anyway, I hope you’ve enjoyed this experiment and if after your own research you fancy running something similar, I’d be interested to hear about it! This entry was posted in Blindfolded Monkey, Dogs of FTSE, Monkey, Portfolio, Shares by weenie. Bookmark the permalink. I had completely forgotten about this so thanks for all the work in keeping track of all the portfolios and providing this final update at the 3 year point. Well done to Mr Zombie but obviously a bit of luck in selecting a big outperformer such as Evraz…is Mr Z still running the blog? Happy with my 8th place and 35% return with 40% bonds…a safe ‘steady Eddie’. If it was run again I would include my Scottish Mortgage in the portfolio. It’s been a while since Mr Z updated his blog – I hope all’s going well for him and that he’s just too busy working towards FIRE and enjoying life to work on blogging! If you’d had Scottish Mortgage in there, I think you would have been a lot higher than 8th place! As a non-DIY investor I am really pleased to see the mention of the Vanguard Lifestrategy 60% fund and its’ healthy return as that is where my passive investments are. Have followed this for the past 3 years as a way of confirming to myself that tracker funds are the right decision for me! Thanks for this final update Weenie. Yes, with all the madness of the randomly picked stocks, I too thought it was reassuring to see how well VLS60% did. This is a fund which I intend to invest more in (only a small amount at the moment). Thanks for doing this Weenie! Really interesting to see what happened next – I love an update. It’s telling how the Dogs fund dropped away in the third year too. Yes, it was interesting how the Dogs fund dropped away, although if the fund was really following the Dogs strategy, some of those stocks would have been replaced by new stocks, which may (or may not) have done better. We won’t know for sure now! I love the experiment Weenie – it looks like it was fun – and it looks like most of the portfolios comfortably beat the FTSE. Ms ZiYou recently posted…Are you comfortable being the product? It was fun and yes, interesting that most of them comfortably beat the FTSE. Obviously, that doesn’t mean it’s a strategy to recommend to anyone but if people wanted to take a bit of risk with some ‘fun money’ then why not!? I’m tempted to do it again for definite! This is a cool experiment! Interesting that, after one year, ten of the funds were negative, but after three, only five were. It’s essentially “buy and hold” in action! Would be interesting to compare this to a global index tracker as well the FTSE100. Yes, the experiment points positively towards a ‘buy and hold’ strategy in most cases. Comparing to a global index tracker would have been interesting, yes. Maybe one for the (distant) future! Thanks Stefano, it was fun to take part in and although I don’t plan on doing another one soon, I may consider doing some other type of experiment! Yes, an average of 29% is indeed something most would take, I would say! Thanks for running this through – interesting to see but I can just imagine the overall headache of tracking things through – so thank you! Glad you enjoyed this FiL but yes, it was a real headache to keep track of! I used to read Mr Zombie’s blog and was sad to see it peter out. If memory serves he pretty much reached his goals so hopefully he is enjoying the fruits of his labour. I wonder if he knows he has been crowned the final winner. I totally see why you are calling it a day on the updates though! Before you close the door, maybe you should also give a prize for the best named fund? Yes, I too hope Mr Z is too busy living the FI life that he hasn’t got time to update his blog. I’ll continue to keep an eye on it in case he does resurface. Maybe I should have run a mini-comp in the first year so readers could vote for the best name! My personal favourite was the Bernie Madoff Slush Fund! What a fun yet instructive experiment! Unfortunately, it takes too much time to update so 3 years is enough! Glad you enjoyed the post! Well, the good thing is that you made a profit and not a loss! Great to hear from you and I hope you are enjoying your retirement! It’s fascinating to see the third and final update on this league. Now I feel even happier with my Vanguard Lifestrategy funds investment portfolio! Thanks for taking the time to track it, and enjoy your rest from it! I’m glad that this experiment also unintentionally confirmed to some people (including yourself) that the Vanguard Lifestrategy funds are the way to go – thanks to @diy investor uk or I would never have included it!